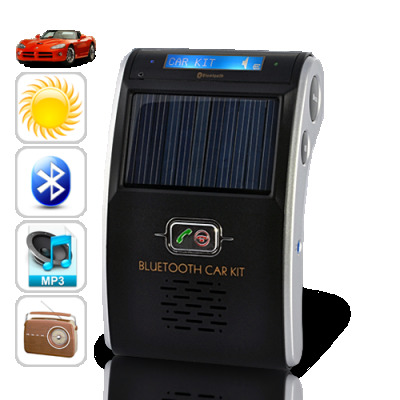 Successfully Added Solar Powered Hands-Free Bluetooth Car Kit with Caller ID (MP3, FM Transmitter) to your Shopping Cart. Enjoy safe hands-free Bluetooth communication in your car with this Solar Powered Car Bluetooth Kit. No messy wire or cables and no need to recharge, just keep this gadget on your dashboard pair it to your mobile phone. You now have the safest and most convenient way to talk and answer calls while driving. There's nothing to it. Just pair your mobile phone with this Solar Powered Car Bluetooth Kit and whenever you receive a call, the caller's number will automatically display on the screen, as well as being read out to you through the speakers! Then, synchronize your phone book with the Bluetooth Car Kit and the caller's name will be displayed too. Last but not least, if your phone has voice recognition, you can even make calls by simply saying the contact's name! And since this device comes with a high quality noise and echo suppression DSP microphone you can enjoy clear and effective communication without interference or distraction. Most importantly, this Bluetooth Car Kit is completely self-reliant thanks to the solar panel, which will recharge the device automatically whenever you're outside! That's right, you'll never have to recharge or even move this device again, how convenient! For those constantly cloudy days, however, you can also power the Bluetooth car kit directly through the car's cigarette lighter socket with the included cable. If you are looking for an extremely easy to use and hassle-free Bluetooth kit that does exactly what you need it to, then this is the perfect device for you. Try this device today at our highly discounted direct-from-the-factory OEM price and start enjoying high quality hands-free communication within a few short days. This solar powered Bluetooth car kit is available now for single piece or discounted bulk orders and ships directly from our warehouse within 24 hours. And don’t forget, all Chinavasion products include our full 12 month warranty. Solar powered, no need for recharging and no messy power cables! This Bluetooth Car Kit is listed as "PPP" under discoverable devices.